This is a wonderful place to live, in my opinion. People who live here for any length of time and are respected by the community are the type of folks that know how to work, have loyalty to their employer and their family and their community, aren’t impressed by folks who cheat on their taxes or cheat on their spouses but don’t judge them for it if they slip up and do, we have many people who commit to community service whether it is at church, at the school, downtown, or at the homeless shelter. We have a wonderful Lions Club and a Rotary Club and they get along just fine, thank you, and will admit the other club does a great job, too. We admire the ones who are in the Guymon Community Theater for their artistic skills even though we know we weren’t blessed with them. In the same vein, we love the Pioneer Day Rodeo committee for the very same reasons. Here in Guymon, Main Street Guymon and the Chamber of Commerce are good partners. We know what the other does for the community and we love them for it. We work together because it’s smarter to work together and get more done. When someone is sick, there are places to go in the community for help like Catholic Charities and Panhandle Partners. When someone needs food, there is Loaves and Fishes, handled by an amazing group of volunteers. This is a wonderful community to live in. Be part of the wonderful. Choose a place for you, for you and your family, for you and your friends, to help make a difference. We are wonderful, certainly not because we have beautiful lakes and beaches, but because the people who live here choose to make it that way. I would love to have everyone who calls become an individual member of Main Street Guymon ($50 a year) or a business member ($200) a year. But, alas, I promise not to be totaling self-serving and to help you find the best match for you. There is one thing that always needs cleared up, though. 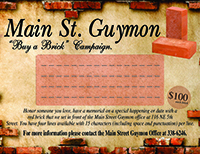 Main Street Guymon has as one of its priorities in the mission to work on the revitalization of Main Street’s historical district. But this doesn’t mean that we are limited to this, our board knows that Main Street means all those who are on Main Street, shopping, working, going to City Hall … so Main Street is for everyone. That means you can go ahead and call.